Uses straps to help prevent lateral sprains without restricting range of motion. Is the RocketSoc Ankle Support right for me? Supports and helps prevent common or acute ankle injuries. Try our Brace Advisor for personalized product recommendations to meet your needs! Great at preventing and supporting common or acute ankle injuries! The DonJoy RocketSoc is a durable and supportive soft ankle brace used to help prevent ankle injuries. Through the patented strapping system the ankle is secured into a natural position, which helps prevent lateral ankle sprains without restricting range of motion. What makes this brace easy to adjust with straps at the forefoot and heel which provides excellent support to the ankle ligaments that are the most commonly sprained. What makes the RocketSoc ankle brace is the easy to adjust peroneal forefoot (sides of the forefoot) and calcaneal heel lock straps which provides unrivaled support to the ankle ligaments that are most commonly sprained - the anterior talofibular, calcaneofibular and posterior talofibular ligaments. The straps lock the ankle in place to provide maximum support to the ankle ligaments that are most commonly sprained. You'll maintain complete range of motion while controlling abnormal plantar flexion and inversion. Lightweight, low profile design eliminates that bulky feeling when worn with a shoe. After a car crash i was in a coma. 6 weeks.& btoken pelvis among several. Other injuries. Now my left foot medially. Rotates & inverts. I go through. Shoes like wind thru a screen door. Ive tried the rocketsoc love it i started with the lace up to hard to get on. Then too tight it would pinch the skin. Which would be more efficient. For me the neoprene. Or drytex fit in my shoe. And good while. At the gym. My daughter is 14 and does competitive cheerleading. She does tumbling in her routine. She just started doing her tuck. During one of her tumble passes she landed wrong and caused an injury to her right ankle. They have diagnosed her with Anterior Ankle impingement. 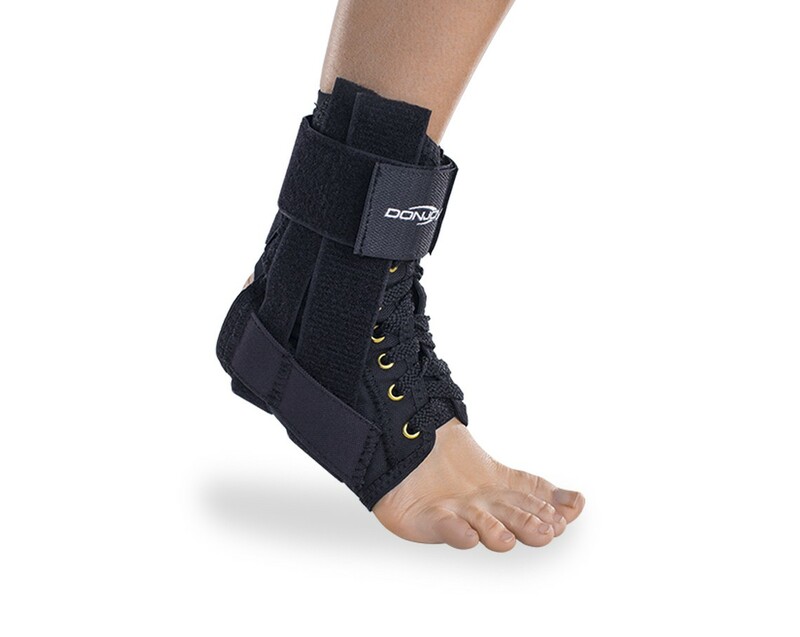 Would this ankle brace be appropriate for her condition & sport? What ankle brace would you recommend to use in conjunction with a ski boot? Will the Rocket Soc ankle support brace fit into a soccer cleat? My daughter needs a brace and this I the 1 I ordered. She has chronic sprained ankles and needs something that will stabilize and support her ankle while playing soccer. Does this brace help with supination. I broke my hee on my right foot three years ago. Have since had sub taylor joint fusion. When I walk my foot rolls out and I am breaking down every shoe I buy to support me. Would this brace keep my foot from rolling out? Thank you. The RocketSoc Ankle Brace should help to prevent the ankle from rolling in and out. The neoprene is the material used in wet suits, it doesn't breathe and gives off a lot of heat. the Drytex is a breathable material so it doesnt get as hot. The Lace-Up style allows for a more custom, contoured fit. Thank you for your question. You can use the Aircast AirHeel which have two interconnected aircells located under the foot arch and behind the heel to provide pulsating compression with each step. This is used for Achilles tendon indications but will provide minimal support. Another option is the Airlift PTTD Brace which is indicated for post-operative support and provides a greater degree of support. There is an aircell below the foot which is adjustable and a rigid portion to provide support to the ankle. My daughter plays softball. About 3 years ago she sprained her left ankle slidding into 2nd base. Basically jammed it and twisted it at the same time. She has sprained/twisted it twice this season doing the same thing. She is a center fielder so she needs to be able to move well while wearing the brace. Which brace do you feel would be good for this? I have a peroneal tendon rupture due to extremely flat feet. I'm looking for a brace with maximum support to help keep me ankle in a more neutral position. Is this the style brace you would recommend? Also is the lace up version the most customizable? The DonJoy RocketSoc is a great stabilizer to help support and protect the ankle, It is lightweight and low profile to fit well inside your shoe. You are correct regarding the Lace-Up style, it does allow for a more custom, contoured fit. Another good option would be the Aircast Airsport, The Airsport has foam filled cushions, for support and comfort. It is easy to apply and is very breathable. It will stabilize and support the ankle from inversion and eversion, plus its durable for outdoor use. My12 yr old daughter sustained a grade 2 ankle sprain, will be playing very aggressive, competitive soccer. Has rolled her ankle a couple of times before, but nothing that she couldn't just walk off. What would be the best supportive brace for her, while keeping all her range of motion? Was looking at the velocity brace, but she wears a size 6 to 6.5. I was diagnosed with a grade III sprain of my left ankle this is accompanied with nerve damage on the medial side. I am experiencing pain during plantar flexion (pushing my toes pointing downward). I want to get back to playing soccer, but kicking the ball during plantar flexion can aggravate this pain. I don't have any trouble with rolling my ankle. Is this a good brace for this? Which of the 3 styles (lace-up, drytex, neoprene) would be the best? Thank you for your question. The DonJoy RocketSoc Ankle Support Brace will help to stabilize your ankle. It may help to prevent your ankle from going into such an extreme plantar flexion and give support when in plantar flexion. The Neoprene may be too warm and thick for your activities. The Drytex is a more breathable material and simple to put on. The Lace-Up is a nylon material. You can also look at the DonJoy Stabilizing Speed PRO for a more streamline option. If you have additional questions please feel free to contact product support at 888-405-3251. I asked a question on the Rocketsoc ankle brace... you said it goes by shoe size.. unfortunately mine did not fit. I ordered one from you guys through Ebay, and it was a size small because my shoe size is a womens 8 - 9. Well my calves are 17 inches around, and the brace will not close on my leg. Is there an extension strap I can get or if I get a larger size will that work? I sent an email through ebay per my order but have yet to hear back. I need to return this unless there is an extender I can use. I really want the brace but as it is, it will not fit. Thanks! I have sprained my left ankle a few times and now it is week because of the sprains. I'm getting back into running again and need to protect my ankle from twisting and wanted to know which ankle brace to get? I am a long time basketball player with numerous sprains. I am looking at the Velocity and the Rocketsoc, but cannot tell if one will fit better than the other inside a high top basketball shoe. Is one of these or another product designed toward basketball ankle injuries? Recovering from fractured lower fibula with dislocated tibia and would like to graduate from large aircast boot to something smaller, more flexible (as doctor permits) that will also accommodate ankle swelling. Would Rocketsoc be approriate? What does it mean to have the optional inferior buttress for swelling available on the drytex and neoprene versions (not lace-up version)? Any large in stock? The neoprene is the material used in wet suits, it doesnt breathe and gives off a lot of heat. the Drytex is a breathable material so it doesnt get as hot. We have all sizes in stock. As for your questions on whether the RocketSoc would be appropriate, that is a question for your physician. I have a narrow ankle and foot, D width max. Should I order 1 size smaller than the chart reccomends for a men's 13? I will be using it for backpacking in rugged terrain. No, you do not need to go with a smaller size to accommodate to your foot width. The brace itself is adjustable in the velcro and lace up portions, so that will make the brace snug to your narrow dimentions. I need to know if this is available for child size age 2 years. Also does this model have a metal frame at the sides for ankle support. Sorry, we do not make this brace in pediatric sizes. The smallest size this comes in is XS, which is a men's size 4-5 1/2. Can a sock be worn under the Drytex Rocket Sock, or is the sock worn over the brace? You should wear the sock underneath the brace. First I would like to explain that I have been buying this particular ankle brace since 1995. It was the best ankle brace I have ever used! I used it primarily for playing basketball in high school and in college. Because of the protection and durability, this brace was exactly what I needed. I have been playing competitive bball for the last 20+ years, and the braces used to last me multiple years and I would wear them 6-7 days a week for intense usage. Now, I play 2 days a week and I am not as active as I used to be and they only last months, let alone a year+. Unfortunately, over the past two years, the product has greatly gotten worse. Back in early 2015, I bought two new braces for my ankles, and within 8 months the A & B (side) straps started deteriorating. I attempted to sew them back together, but that didn't even work. Eventually, I bought a new pair, 8/2016 and within 3 months of use (little - moderate use) they again began to come apart. I never got around to contacting the company until 4/2017 and by then the 6 month "warranty" was up and the company refused to replace the defective product. It's a shame how a once great product can now be a waste of money and it's also a shame that the product only lasts a few months. So, if your braces even begin to rip or come apart, the sooner you contact them the better (even though they'll more than likely send you the same defective brace - so it's a moot point). Hope this helps. This ankle brace is the best you can find. Ive gone through plenty of ankle braces and its obvious this is the best. I purchased a RocketSoc Drytex for my left ankle over a decade ago and it still works great. I recently ordered one for my right ankle and it isn't cut the same as it was over a decade ago. There is a gaping error with excess material that lays between the inside ankle and metatarsal. The supporting side straps are not placed correctly. It should line up against the outside of the ankle when it gets pulled up for that stabilizing support. The one I received did not line up against the outside of my ankle, but instead started about 3 inches from my heal toward my toes, and when pulled up to Velcro against the ankle created a massive gap instead of laying flat, which provides zero support. I called customer service and sent them photos. They agreed the cut was incorrect, so they sent me a new one. Unfortunately the second attempt is cut the same exact way. They graciously provided an RA# and shipping label for me to return them both at no extra cost to me. I'm thankful for their attentiveness in customer service, but my rating is solely based on the product. I'll keep looking for another one in hopes I can find a batch that was cut properly. This is the second time I've owned this brace. The lateral stability is amazing! I have a severe foot drop from a severed nerve. I have absolutely no control of my foot and this brace provides me enough support to be able to golf again. Excellent product, price and value. Sizing information was very accurate and what I ordered was perfect. The brace support is excellent and does all that I had hoped. Brace is well made and very durable. Used it for years and love it! I have a chronically weak ankle that has been sprained multiple times over the years (could sprain it walking acrossed a lawn). I bought my first DonJoy RocketSoc years ago and have been hooked since. I weigh about 250# and play basketball regularly and I have never sprained my ankle wearing one of these! The neoprene seems less bulky and holds up a little better for me than the cooler Drytex. This is the most complicated product to fit. I purchased the Drytex model since my desire was daily wear. The manufacture seems to be very high quality, but it's design is too complex and comes with a very poor user manual. Never used it once. My ankle feels secure while wearing this brace. I feel it offers a lot of protection. Adjusting it to the correct fit did take some time with the various velcro straps but it is worth it for a snug and secure fit. This product is great once you get it on your foot, but the size ran small in my opinion. I wear size 13 narrow shoes and found I could barely get this on and I bought the size XL and wished I had bought XXL. I have slender feet (narrow sizes when I can find them) and it's still barely big enough and have to pull hard on the inner ankle velcro before adding on the two ankle straps. The two straps around the heel and the arch have to be twist somewhat creating a gap at the heel and the arch as the strap is twisted a bit so that the design needs some improvement on these two straps. Once it's on it's very snug and holds your ankle well. However, don't do like me and buy it just two months after breaking your ankle as the compression can lead to pain. If you want milder compression buy it a size larger than recommended. Bought a pair of these and very pleased with Donjoy quality and able to get at a great price.